Beginning in June 2011, about 65 US PepsiCo employees of various career levels and functions began the first of their monthly WebX lunch meetings. Beginning in June 2011, about 65 US PepsiCo employees of various career levels and functions began the first of their monthly WebX lunch meetings. There, a high-level Frito-Lay executive made a presentation to offer talking points about its brand portfolio. Another session included the art of storytelling and how to start a blog. A third one taught staff how to engage a restaurant manager when dining at an establishment that doesn't serve PepsiCo products. 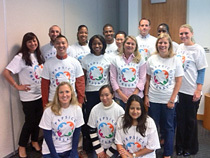 This was PepsiCo's first corporate ambassador pilot program, which took place over six months and ended in December. "We have 300,000 employees globally for PepsiCo and they, in a sense, are our natural ambassadors," says Sharon Phillips, director of global internal communications. "They're proud of the company, so why not use their voice in this? The only way to do that is to make sure they're equipped and engaged to do it." Brand ambassador programs help promote a company's products and services in a unique and authentic way, but PepsiCo went a step further. It aligned its first ambassador program with its recently refreshed corporate reputation initiative and its Performance with Purpose strategy that balances financial returns with giving back to communities. The 65 ambassadors from PepsiCo's four headquarters in Purchase, NY; Somers, NY; Chicago; and Plano, TX, were invited to opt in. They represented a cross section from the company's marketing, communications, finance, and operations functions. The pilot program marked PepsiCo's first major corporate reputation effort for employees. The external part, which began about two years ago, Phillips adds, sought to change the perception of PepsiCo from a soda producer to a socially responsible food and beverage company. PepsiCo also launched the pilot program in Brazil (August) and the UK (October). A broader US rollout is slated for this year, notes Phillips. Anthea Hoyle, VP of Ogilvy Impact, a specialty offering within Ogilvy PR Worldwide that focuses on employee engagement and internal communications, says many companies are starting to realize that positive results will be seen most of the time if you don't restrict your employees from talking publicly. "If you give them guidelines on how to post things, employees will generally follow that," she explains. "Most companies are still cautious, but those willing to give it a go are the ones who are making it less restrained." This past fall, SilkRoad, a provider of talent management tools, launched Point, software that encourages employees to network and collaborate, while also measuring their influence within the company. The tool, similar to Klout, tracks trends and identifies subject-matter experts. In addition to being useful to an HR department for recruiting and recognition, Point can also be used by upper-level management to find natural leaders within the organization. In spring 2009, Philips North America launched the We Are Philips program to help better interact and engage with its steadily growing workforce after a number of acquisitions, says Mark Stephenson, corporate communications head for Philips North America, a division of Royal Philips Electronics, which employs approximately 125,000 people globally. "Our main focus was to educate our employees about our company because we're pretty substantially sized," he says. "It's easy to get lost in the organization, so we really wanted to inform them about the larger Philips, as well as what we do in North America specifically." The initiative, supported by Ketchum Pleon Change, has seen more than 250 invited employees participate. They share their stories about working for the company and acknowledge team achievements and fellow colleague's accomplishments. For 2012, Stephenson is thinking about taking what has mainly been an internally promoted effort and giving it a public face to connect with customers and key stakeholders. Philips is also looking to tie it more closely with social media.